RLI began to expand and receive grants and contracts to provide additional services to individuals with disabilities. RLI established contractual agreements with the City of Philadelphia to provide homemaker services and with the Pennsylvania Department of Public Welfare to provide personal assistance services. 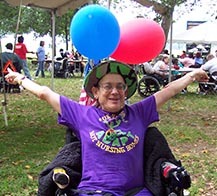 With additional grants from the Pennsylvania Office of Vocational Rehabilitation, the Center was able to offer transitioning services to individuals leaving institutions and other sheltered environments for independent situations in the community, and opened a satellite office in Delaware and Montgomery Counties, thereby bringing Independent Living services to residents of the suburban counties. RLI also became part of the state task force to create the first Act 150 attendant care program and a provider of attendant services. Years later, that satellite, called Freedom Valley Disability Enablement Center, was incorporated and now serves the counties surrounding the Philadelphia area.